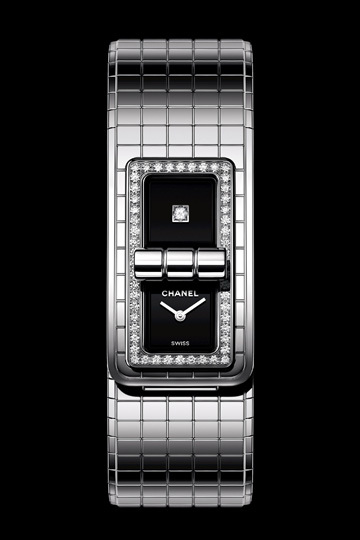 Chanel Code Coco watch with steel case and bracelet, set with 52 diamonds, featuring two black dials – one set with a princess-cut diamond – and powered by a quartz movement. 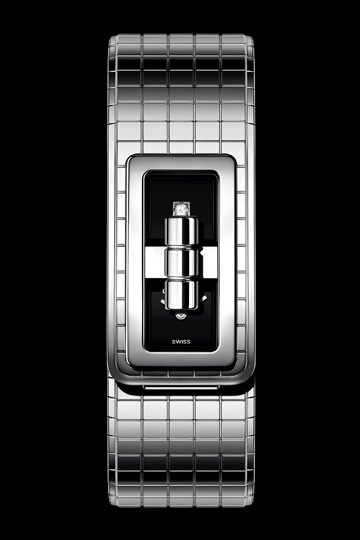 Chanel Code Coco watch with steel case and bracelet, featuring two black dials – one set with a princess-cut diamond – and powered by a quartz movement. But as simple as this might seem, it is, of course, anything but. Creating a watch is usually a process that takes many years; especially when it is a completely new model like the Code Coco, which was launched in early October during Paris Fashion Week. The Code Coco also marked the 30th anniversary of Chanel’s horlogerie collection. This meant, of course, that it had to be a creation that linked the visual fashion heritage of Gabrielle ‘Coco’ Chanel and her status as an inventive style innovator. And it succeeded. The clasp and chequered pattern of the famous Chanel 2.55 bag – named after its date of introduction, February 1955 – were the inspiration for the design of the steel case, which is as ingenious as it is luxurious. The dial can be partially concealed with a quarter turn of the clasp. In this way, Code Coco is transformed from a design watch into a strong, sleek bracelet, entirely in the spirit of Coco Chanel, who liked to integrate masculine elements in her designs for women. Innovation and simplicity always went hand in hand for Coco Chanel. With her elegant-yet-uncomplicated designs, she wanted to liberate women in the 1920s from uncomfortable, tightly corseted attire. During her long fashion career, she created, among other things, the little black dress and her iconic two-piece suits, but also her famous perfumes, handbags and jewellery. Chanel was always searching for something new and that is still typical of the brand today – including the watch division.